Mobile offices are modular buildings or portable trailers that provide an affordable alternative to traditional office space. Mobile offices are available as temporary or permanent solutions for companies that require a suitable structure to conduct daily business but lack the time, space, or funding to build an office on-site. Many modular office solutions are utilized by contractors, schools, industrial parks, medical providers, retail businesses, and even government facilities for short-term and long-term uses. Various customization options enable mobile offices to meet the needs of nearly any type of business. Equipment Rental Direct has all of the information you need to choose the mobile office setup that is just right for your business. Available in a wide variety of sizes and styles, with numerous customization options, mobile office rentals have the ability to conform to the specific requirements of your company. Convenient and very affordable, portable office trailers are optimal for use on construction sites. They also provide adequate space for mobile medical services. Mobile office trailers provide from 160 square feet up to 1,344 square feet of prime space for team meetings and client appointments. With multiple floor plans available and a very short lead time, this is the office solution for any type of entity that needs a clean, comfortable space quickly at a minimum cost. Modular executive offices provide a secure, comfortable place to conduct business. Executive offices come standard with comfort controls, electrical wiring, and built-in plumbing. These offices start at 384 square feet of space and can reach a maximum of 1,344 square feet of interior room. Floor plans are split and offer modern conveniences such as closet space and, optionally, multiple private meeting rooms. 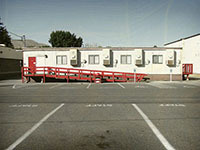 Many private and public schools utilize modular classrooms. These modular structures provide adequate space for an additional library, faculty lounge, laboratory, or a traditional classroom setting. 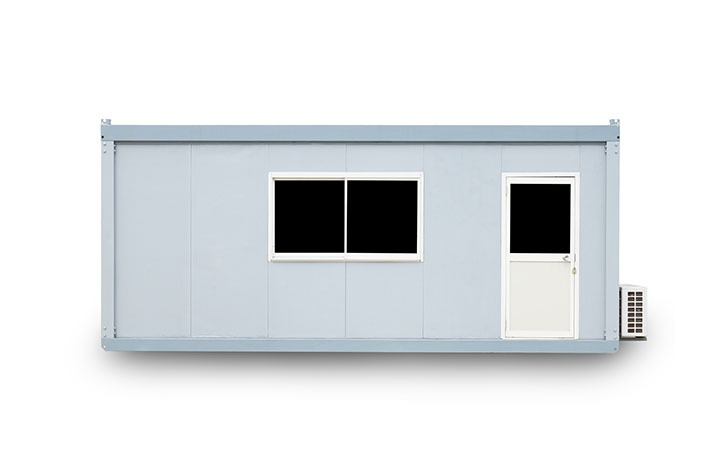 Modular classrooms can be used temporarily while new facilities are being built or they can be used as a permanent facility. Portable classroom trailers can be configured as multiple units to meet the exact space requirements of the school. A modular classroom is an affordable way for a school to meet expanding student enrollment numbers without exceeding budgetary restrictions. Mobile office complexes give you the option to add or remove space as needed. Modular buildings are assembled at your site in a minimal amount of time. Modular office complexes are used in a varied array of industries and include small, temporary buildings as well as massive, semi-permanent structures. Mobile office complexes are an optimal way to add needed space to your existing facility, or to get your business up and running while your permanent structure is being built. 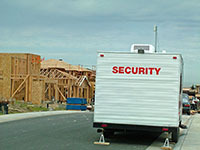 Mobile Security Office - On many construction sites, temporary security may be needed to ensure equipment or inventory is not stolen or vandalized at night. A mobile security office will provide a place for officers to monitor cameras and serve as home base while on duty. Rural Veterinary Clinics -In areas of the country where mobile veterinary services are offered, these modular office spaces are an affordable way to provide rural veterinary services. Sales Offices -Businesses that need space for seasonal sales associates utilize mobile offices during peak times of the year. Non-Profit Organizations -Non-profits often use modular offices during fundraising events as a meeting or resting space for volunteers. Carnivals -Many towns use mobile office trailers during carnivals and fairs as a space for vendors to plan and organize. There are many customization options available to make your mobile office more conducive to your line of work while, at the same time, taking away some of the stress that comes with planning an expanded office solution. From furniture that will keep you on task to full management packages that get your modular office up and running efficiently, the choices are endless. Steps and Ramps -Ready built steps with rail systems attach quickly and easily to your mobile office trailer. Ramps provide accessibility for workers and clients. Awnings -Canvas or aluminum awnings provide protection from the elements and add a distinctive appearance to the exterior of your mobile office. Furniture Options -Add chairs and tables, desks, filing systems, media cabinets and more to your modular office space. Utilities -Ask for your mobile office to come wired and ready. Electrical, plumbing, and HVAC turn your temporary facility into a space suited for long-term productivity. Kitchen Comforts and Restrooms -Add coffee stations, a refrigerator, or even a microwave for ultimate convenience during long work days. Restroom facilities can eliminate the need for exterior sanitation stations. Decks and Skirting -Deck options start with simple aluminum walkouts and extend to spacious wooden wraparounds. Skirting is functional and aesthetic; eliminating access to the underside of your mobile office while providing a pleasant looking cover for the area between the bottom of the structure and the ground. Media Wiring -Your modular office space can be wired for telephone systems, fax machines, data communications, and Wi-Fi. Complete Management Packages -Start work right away without worry when you utilize mobile office complete management packages. Have a professional mobile office planner deal with permitting, scheduling, site prep, and follow-through. Insuring Your Investment -Some mobile office rental companies offer tailored insurance plans to protect you from the costs associated with damage and liability. Ask about insurance options for the mobile office configuration you choose. A modular office can add much needed meeting space to your current site or provide a building at your startup location. It is the solution for remote work areas or spaces where a permanent building is simply not feasible. Equipment Rental Direct will help you find the modular office or office complex that meets the needs of your business, large or small. With a short time from conception to execution, mobile offices are your answer when you need office space quickly.